Until just a few years ago, only professional baristas were known to use milk frothers. But thanks to technology, you too can now easily access modern frothers for use at home. If you are crazy about beverages like I am, then you will agree that you enjoy the frothy ones best. Having a frother at home means you no longer have to overpay for your cappuccinos! You can now make them from the comfort of your home. Milk frothers mix air and milk to form froth. Selecting the right frother can be a bit overwhelming, because of the various makes available in the market today. Because frothers can be quite pricey, I advice that you take do some research before buying one to avoid losing money. I have reviewed 5 milk frothers that I consider the best in the market today to help you choose the right one for you. Breville is a trusted name when it comes to kitchen appliances. Their BMF600XL Café Milk frother is one of the best frothers in the market today. This frother has a user-friendly design, thanks to the handy cup it comes with which can be used to measure and add ingredients before frothing begins. The unit has a stainless steel milk pitcher making it durable and what’s more, it is dishwasher safe. The inner lining of the pitcher has calibrations ensuring you pour in just the right amount of milk. This frother produces enough froth for 3 big cups making it ideal for when you have company. The BMF600XL allows you to customize the exact temperature, type of foam, and amount of foam you want to create. It has a circular dial with which you set the milk temperature from cold to 160 degrees Fahrenheit. The foam is created by the spinning magnetized disk while induction heating warms the milk. This frother can make hot chocolate too, making it all the more endearing. To make decadent chocolate, simply throw some chocolate into the milk as it heats and froths. It can be used to make many different types of beverages, like coffee, hot chocolate, etc. Can I use this frother to heat milk without making froth? Yes, you can. It comes with two disks, one for creating froth while the other one for just heating milk. Many frothers make large bubble foam that disappears quickly. Does this one create foam that will last for long? Yes, it makes a thick layer of foam that will last for long. How does this milk frother work with soy milk? Not so well I’m afraid. I tried it but I wasn’t happy with the results. I prefer using this frother with almond milk. Can I add sugar to the milk before frothing and still get good froth? You probably won’t get froth because anything that is uneven a little gritty in the mixing prevents the foaming spinner from spinning. What is the minimum amount of milk required? The Breville BMF600XL milk café frother is pricey. However, it has such fantastic qualities that it would be a shame if you passed it up. If you are really serious about your frothy drinks and don’t mind digging a bit deeper into your pockets, then this is the frother for you. You will simply love it! 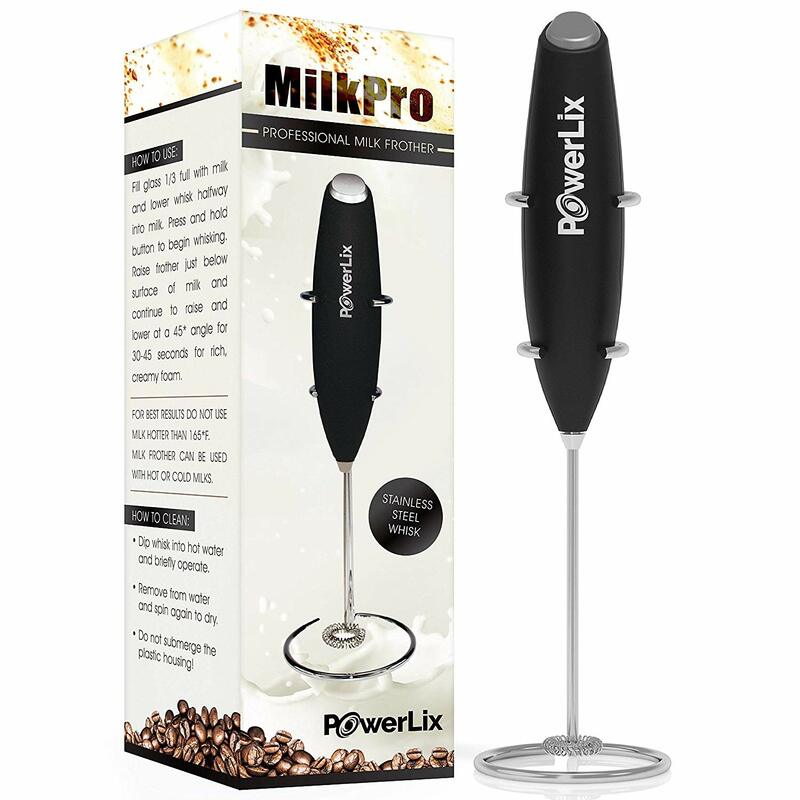 The PowerLix milk frother is a handheld, battery operated little appliance that looks good while staying really quiet. This is great because for most of us, listening to a loud machine first thing in the morning isn’t a thing we look forward to. It takes only two AA batteries but it has been built with a 1900 rpm powerful motor which spins the stainless steel coil producing a great froth in only a matter of seconds. It doesn’t matter what milk you are using, be it soy, whole, cream, coconut, this little frother guarantees you get great tasting frothy drinks each time you use it. The PowerLix handheld frother is expertly made. The coil and all the parts that enter the milk are made from stainless steel. It also comes with a stainless steel stand so you can set it nicely on your counter top. It has a powerful 1900 rpm motor which makes its foaming ability quick and effortless. You can make a variety of drinks with this little frother from just regular coffee to cappuccino to hot chocolate to latte. 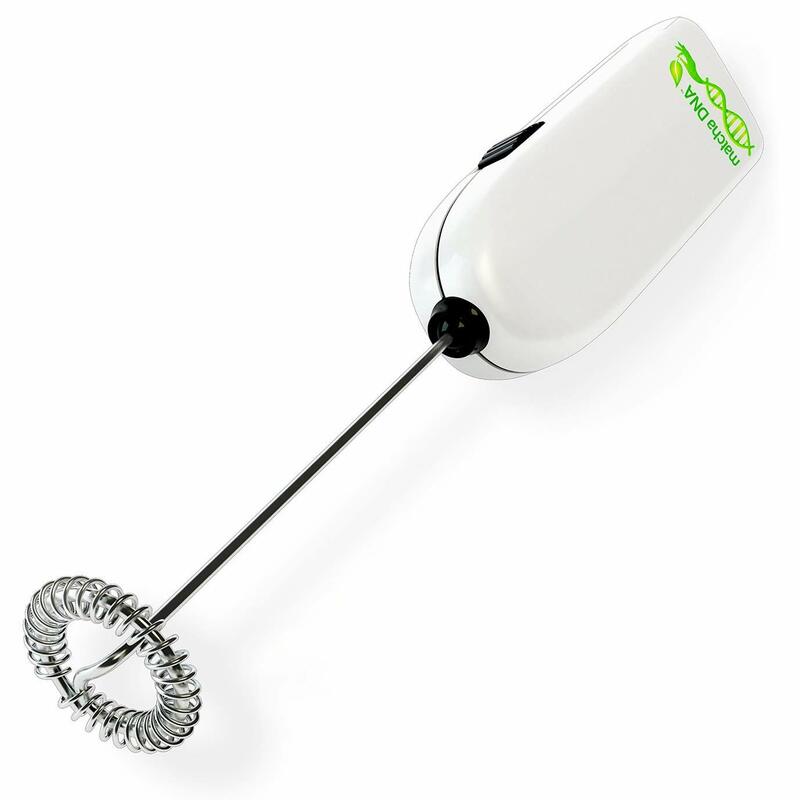 This handheld battery operated frother can be easily cleaned by submerging the coil into a water and dishwasher mixer. I suggest you clean this frother right after use. Leaving milk to get dry on it just makes it harder to clean. You get a choice between red and black. What type of batteries does it use and do I need tools like a screw driver to change them? This frother uses AA batteries. Changing them is seamless. You require no tools at all. Can I use it to blend eggs for omelets? it I don’t think this is ideal for eggs. It struggles with anything thicker than milk. Does it heat the milk as well? If you are simply in search of an entry-level milk frother to kick your home brewing game a notch higher, then the PowerLix milk frother is your best bet. It is affordable and it produces a wonderful froth at the press of a button. Go on and get it! You will love it! The MatchaDNA milk frother is powered by electricity and has the ability to form thick, creamy and consistent froth to spice up all your favorite beverages be it lattes, cappuccinos or even hot chocolates. This is froth that lasts meaning you don’t have to gulp it down in a hurry to beat dissipation. It has a capacity of about one cup of milk. This is of course not enough for many servings but it is so easy to operate, so running it a number of times isn’t a problem. This milk frother is durably built with a stainless steel body and a plastic handle that guarantees a firm grip. The shaft and whisk are made from stainless steel too. It is also pretty easy to use. Just pour in your hot milk-if you want your drink hot- and froth it simply by the touch of a button. This frother also froths cold milk rather well. The MatchaDNA milk frother is surprisingly affordable, given how good the whisk is. It costs about a third what its competitors cost and the whisk works better than a lot of the more expensive models. It is also very easy to clean as well as to store. You may require getting an extension cord because the provided one is rather short. Can I make hot and cold foam like with a Nespresso machine? Yes, this frother froths both hot and cold drinks. You need to heat your milk first though because it doesn’t have any heating capabilities. 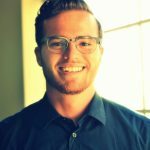 How can I avoid the coil from getting rusty over time? Always wipe it down after every use. Is this appliance very loud? If you are looking for a simple to use frother to test on all your favorite beverages, then you have found a winner in the MatchaDNA Handheld Electric Milk Frother. It is inexpensive and will last you quite long. It doesn’t take up much space on your kitchen counter and is easy to clean. Try it, I know you will love it. 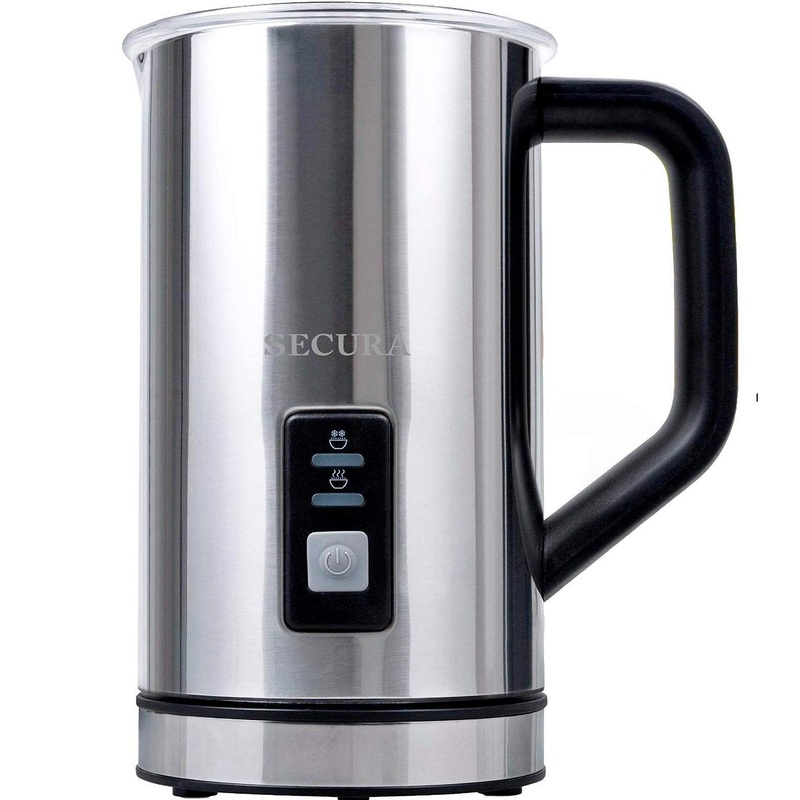 The Secura Automatic Electric Milk Frother and Warmer is a wonderful choice if you are looking to froth a lot more milk than most of the other electric frothers can. 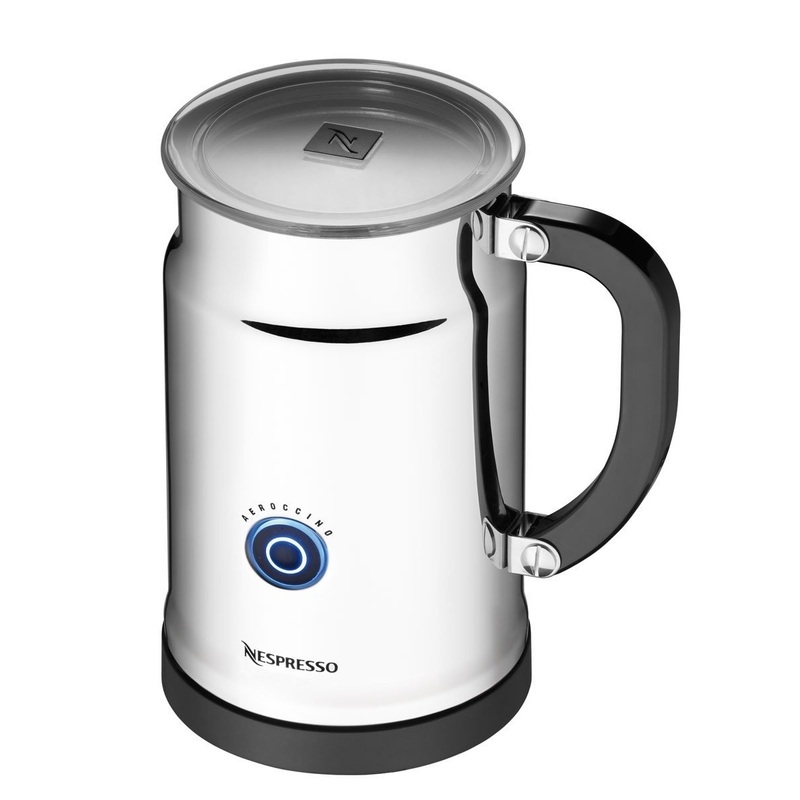 It has a froth capacity of 250ml and an impressive 500ml for hot milk preparation. This is twice the capacity of most of the other automatic frothers you will come across. It can create hot and cold froth cappuccinos as well as hot froth for those lattes that you love so much. It has a sturdy exterior made from stainless-steel which is very pleasing to the eye. It has vacuum insulation which keeps your milk warmer or cooler for longer. The base can be detached making it possible to store in fridge or freezer. It also means you don’t require to unplug each time you want to empty the froth or milk from the carafe. It also has maximum and minimum indicators, which ensure you put in just the right amount of milk. This is especially important when you are frothing your milk as too much milk will result in loss of foam due to overflowing not to mention make a mess. Like all automatic milk frothers, the Secura Automatic ELECTRIC Milk Frother and Warmer comes with a heating element. This means you don’t need to pre-heat your milk before frothing it when you want your drinks hot because it will do this for you. How can I make cleaning of this frother easier? You need to clean it right after pouring out the milk or froth so it doesn’t dry. Remove the whisk, run it under hot water to remove all the milk, clean it with a soapy sponge then rinse. How well does this froth milk alternatives like coconut and almond? It froths them up well. Maybe not as firmly as with skim milk, but it gets the job done. How hot does this frother make the milk? How long does it take to froth? This Secura Automatic Electric Milk Frother and Warmer is a perfect solution for all your frothing needs, be it cappuccinos, hot chocolate or milk shakes. It is fast and quiet. It has a non-stick interior, strong stainless steel construction and insulated vacuum for preserving the temperature of cold or hot drinks. It has a large capacity and a beautiful design and the fact that it is so well priced makes it all the more the right choice. It is ideal for home or office use. Why don’t you try it? It won’t disappoint. The Aeroccino plus Milk Frother is a beautiful appliance which produces beautiful thick, creamy froth in a matter of seconds. The body is beautifully made with stainless steel and comes with a handle for easy pouring. It is easy to clean by hand thanks to the non-stick material coating inside the jug. I advice you clean it every time you use it to prevent milk from sticking. Simply put it under running water. This frother gives you three options; cold froth, hot froth and hot milk. It uses induction heating to make sure your milk stays cooler or hotter for longer. It has a magnetized spinning disk which makes the foam. With this milk frother, you get to choose between two levels of foam density. Using this frother is a breeze. Simply pour in the milk, about 1/3 of the container, hit the button on the side and wait for your froth. Once the frothing is done it shuts off automatically. This takes less than a minute. It is easy to clean. Simply use a wet sponge and some dish soap and then rinse it under running water. It is small hence takes up little space on your kitchen counter. Do I have to buy a Nespresso coffee maker to use the Aeroccino? No. It’s a stand-alone milk frothing machine with which you can turn any cup of coffee or espresso into a delicious latte in seconds. Does it warm up the milk? Yes it does. And, it doesn’t warm it up too much so you won’t burn the milk. Can I store the left over milk in the fridge? Yes you can. In fact, you can put the entire machine in the fridge and pull it out and use the left over milk the next time. Just remove the main container from the base to store in fridge or freezer. Can I use any kind of milk? You can use homogenized milk, which contains more fat hence produces a better froth. I also tried 2%, which worked well. I don’t think the quality of froth would as good with skimmed milk. The Nespresso Aeroccino is a great milk frother. It is beautifully designed and sturdily built. It is easy to operate and clean. I have no qualms recommending it to anyone. Type – there are two types of frothers, Handheld and Jug Style. Handheld frothers use batteries and Jug Style frothers are electric. Milk type – all frothers froth cow milk wonderfully, but some of them struggle with other types of milk. Make sure the frother you get can froth your preferred milk to your satisfaction. Temperature – some milk frothers come with in-built temperature control enabling you to customize your coffee to suit your needs. Construction – the quality of the frother is important. Stainless steel and glass are great options to consider. Also look for a frother whose plastic parts do not come into contact with the milk. Price – Jug style frothers are generally more expensive than handheld ones. Warranty – If you are getting a handheld frother you will realize they don’t come with warranty. Electric ones come with limited warranty. Ensure you are comfortable with the length of the warranty before you purchase your frother. Well, this concludes my review on the various frothers. It is important that you take your time before selecting the right one for you. 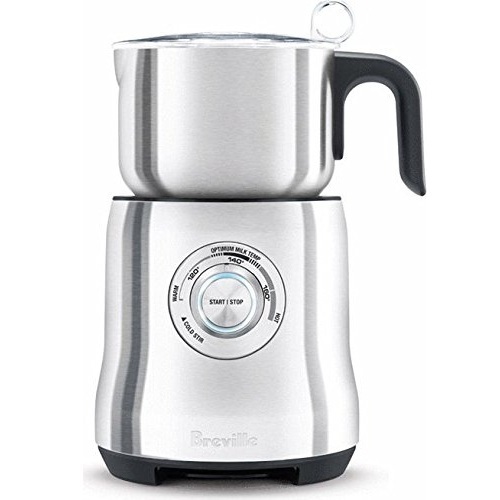 After trying out each of the frothers reviewed above, I personally recommend the Breville BMF600XL Milk Café Milk Frother. It is sturdily built, well and beautifully designed and makes the most beautiful froth in no time at all. It is super easy to clean. Its pricing may be on the higher side but you will discover that it is worth every single dime. If you are simply crazy about your frothy drinks, cold or hot, and don’t have a problem digging a little deeper into your pockets, then this is without a doubt, the right milk frother for you. Don’t hesitate to buy it. You will love it!